Could Carmageddon Have Been Avoided? Another plan to replace this bridge was introduced too late to avoid Carmageddon. The project is well underway and there is no turning back now. But looking at how long this is going to take, and the $1 billion price tag has some shaking their heads. "It's unfortunate that it didn't come up earlier, because the alternative plan was a better plan," said LA County Supervisor Zev Yaroslavsky. 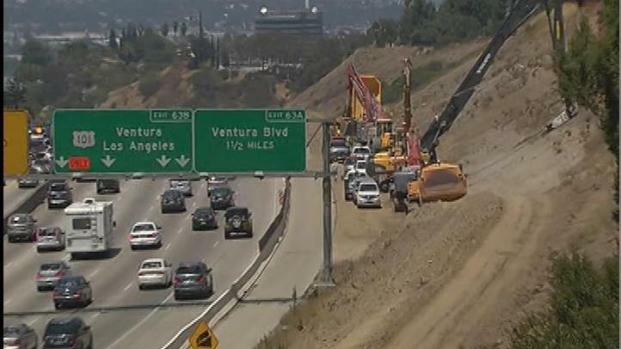 A cheaper alternate plan which would have built a new bridge before tearing down the old one, was blocked by a group who raised aesthetic and other objections, leaving in place a plan which means the 405 will be shut down, not just once, but twice in the next year. Yaroslavsky said another plan -- to build a whole new Mulholland Bridge and tear out the old one -- may have saved money and headaches for commuters. But, he said, once a certain group of residents started to raise complaints, Metro did what it had to do. "If they hadn't done what they had to do, a year from now, you'd be asking Metro and CalTrans why did you delay a project and cost another $150 million?" said Yaroslavsky. For social users, Carmageddon is a chance to create community and find deals for the stay-at-home weekend. The Brentwood Residents Coalition, one of the opponents of the upgraded design, worried it would alter the historic and scenic views of the Mulholland Drive. The group wanted extra environmental studies done. "If you have a committed group of people who are opposed to something, and you haven't done the proper environmental documentation, they're likely to sue, and if they do -- even if they aren't successful in the lawsuit -- just the lawsuit itself can hold you up by a year," said Yaroslavsky. People who live and work near the southern closure point for this weekend's 405 shutdown are ready for anything. Some are even looking forward to it. And any hold up could mean higher construction costs, not to mention the cost to fight the lawsuit. Another issue was raised when the Mulholland Scenic Parkway Design Review Board requested a world-class architect to design the new bridge. Those might have been good ideas, but they came up too close to the end of the process. "Metro made the decision that they didn't want to wait," said Yaroslavsky. "The cost of waiting might exceed the cost of the alternative. I can't fault them for that judgment. The idea was a good idea, and it had my support, but it came up too late in the process."